An interesting idea emerged yesterday from the Uptown Business Association for improving the southern end Symonds St. It’s an area I know well having formerly lived in an apartment right above this part of Symonds St for a number of years. Upper Symonds St above Auckland’s CBD is being eyed as a largely pedestrianised zone – above shallow vehicle tunnels – when trams return to the city. 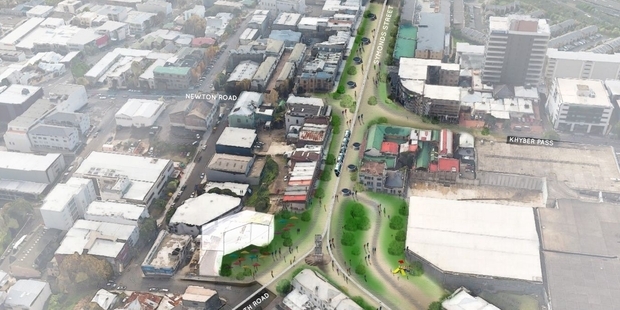 The Uptown Business Association has produced a conceptual design for the “greening” of what is one of Auckland’s main traffic bottlenecks. Business association manager Gary Holmes said it would create a popular community focal point for the more than 700 businesses and thousands of residents based around Eden Terrace, Grafton and Newton. “The main problem for Uptown is that currently it is dissected by a number of major arterial roads which join at the central point of the business district, greatly reducing the opportunity for any cohesion or sense of community,” he said. The business association has come up with its proposal as a way of encouraging people from new mixed residential-commercial developments around the Mt Eden rail hub, to spend a few minutes walking up the hill to Symonds St.
Mr Holmes acknowledged the proposal would mean the loss of parking but said making the precinct more pedestrian-friendly would counteract impacts on businesses. His association intended spending $20,000 to $30,000 in each of the next two years or so on firming it up or considering alternatives, during which financial estimates should emerge. Pacific Environments managing director Peter Eising said the proposal offered just one potential solution for the area’s redevelopment, but the challenges it faced meant visionary thinking was required. I think it’s great that the business association are trying to think about how they could redevelop the area to be more people friendly and having lived there I certainly think this part of Auckland has a lot of unrealised potential. I’m not entirely sure the concept they’ve come up is all that realistic or practical though. For starters sinking the roads into a trench would be horrendously expensive and given the image shown would likely cost hundreds of millions. Given all of the other priorities in Auckland I can’t see this one ranking highly on the list. Tunnels such as these also present other issues such as the portals at each end to get the road back to the surface and the need for expensive ventilation, fire and other safety systems. Also to be considered is that currently Symonds St and Khyber Pass are a key route for trucks carrying over dimension loads from the port – I’m not sure if that would change with light rail. Thinking about how the area could be improved a couple of things immediately spring to mind. The part of Symonds St north of Khyber Pass is quite wide by Auckland standards, in some places around 35m between buildings. This provides a lot of opportunities to make better use of the space for all modes. Light Rail plus improved walking and cycling options could easily fit in alongside general traffic lanes that have been calmed to reduce the chances of people speeding. With the business association keen for improvements then perhaps the next step could be for AT and the council to look at what could be done to at least temporarily improve the area. Perhaps they could put into practice some temporary changes to see what works. One of my old drinking joints, the Astor Hotel was taken out to make way for yet another slip lane. That area has potential but is very unfriendly towards people at present. The business association’s idea is great in theory but as you say, where is the money to come from? Lower down Symonds Street the University also came up with the same idea – undergrounding the traffic from Alfred Street down towards Waterloo Quadrant but with no idea of who was to pay for it. Oh yeah – and a business association backing the reduction of parking to make the place more people friendly. Murray Crane would have the vapours if he heard that! Well, that’s $20,000 to $30,000 his association is wasting. Ordinarily I’m all for letting dreamers get their creative on and ‘think outside the box’ but this clearly is never going to fly. Never. I’m guessing the central idea will require a cut ‘n cover trench with the new plaza built on top. I’m also guessing that it will be only one lane in each direction for cars within this ‘tunnel’ because cars = Hitler. But even with that cheapest option (although I suppose ‘no cars = no tunnel required’ would be cheaper) it will still cost a sizeable fortune that won’t pass the ‘economic’ test. As I said, ordinarily I’m all for letting dreamers get their creative on but in this instance how about we all stay focussed on what is really achievable? (And no, turning the whole area into a Shared Space as an alternative is not viable either – this is a major vehicle intersection, like it or not). Only because we allow it to be a major vehicle intersection. Calm it, remove all those slip lanes and signals for drivers to go so fast, reduce overall capacity and humanise the area – people will simply drive somewhere else and avoid using this area as a rat run between Newmarket and the motorway west. It’s only the vehicular hell hole it is because it’s been built to be that way, can easily be changed if there is the will, and something needs to be done, because it’s a fairly soulless and dreary place at present dominated by a sea of asphalt. And just where would that magical “some place else ” be. Love the lack of logic the anti car people have. It would disappear- it’s called traffic evaporation, it’s the flip side of induced demand. Also, don’t discount the thousands of people that could live here and not clog up the rest of the city, if it wasn’t a traffic sewer. Given grafton bridge is closed to cars, there is a huge catchment funneled through this intersection. Alternative routes are impractical. Anthony, yes, there is terrible network connectivity. The street system has been obliterated by the motorway. Still, the choice remains. How many cars do you want to expedite through here to the queues at the next red light? exactly, these cars arent driving themselves. They all contain people wanting to go somewhere. So unless they can fly how else are people going to get where they need to go? Removing the central planted area and trees and using that space instead as additional footpath space with trees planted where parking currently is would go a long way to reducing the freeway feeling that currently exists there. Removing those slip lanes is a real must, but the intersection itself also needs several red light cameras, I don’t think I’ve been there once when I have seen cars going through red lights at speed when other directions already have greens. Is this because, without a Newton station with the CRL, they’re looking for other ways to rejunevate the area? Good that they are thinking about options, but this one will undoubtedly fail on practicality and expense. Also I don’t think they realize just how awful the portal structures would be. Big wide holes for traffic going down, footpaths going up at the sides, light rail going up in between the cars going down. The traffic portals would be about five meters tall with a solid crash barrier across the top and down the sides. Look to Wellesley st going under symonds for what is looks like. Likewise the little white line for trams is disingenuous, they would actually require a long concrete ramp about 6m wide. They would be ringing their precinct with five life-killing structures. I noticed as well as Murray Crane, the owner of Cafe Melba not being happy about the lack of parking on O’Connell. Don’t think it’s affected his business too much. I wonder if the majority of his breakfast business comes from drivers or from inner city residents (like myself), visitors and tourists (e.g., cruise ships). But what if he doesn’t have room to park his car in front of the café if he starts working in the morning? Then he has to walk all the way from the Victoria Street carpark to his café. That actually makes sense. I don’t like walking on High Street either. A nice idea, but even though it’s dramatic, it show lack of imagination to me and is still focused on cars. i.e. there seems to be an assumption that if you remove lots of traffic lanes from the surface you have to move them underground. The biggest part of the cost is around providing a solution so that drivers are not affected. Why not try and reduce the roads rather than expensively move them? Probably a similar case is cemeteries for their lack of return and voracious use of land. On addition they effectively permanently sterilise the land. You’re trolling the wrong post. But yes, cemeteries are big wastes of land. It’s very common to move them. We built a motorway on top of ours (talk about frying pans and fire! ), Melbourne built their main market and now soon some apartment towers on theirs. Has anyone seriously looked at ways to activate Grafton Cemetery for use by the living, apart from the cycleway proposal which got nixed? Or would any activation be defeated by the terrain and seclusion, or the “heritage” focused NIMBY (Not In My Bone Yard) brigade? This is an opportunity for government trying out a joint design and funding development program. As we know private developers can build things cheaper and more efficient, it could be possible with less money. A win win solution is the business who owns the land nearby contribute money and run the improvement construction. In return, the council would change the land density for high raise mixed use so the land capital gain would offset the inital construction cost. It’s conceptually dated; the idea that a place can’t be improved without first spending hundreds of millions on providing new ROW for the traffic that is the cause of the whole problem. Still it’s an idea that goes on; Pakuranga flyover, Westconnex in Sydney. Perhaps, just perhaps, a much smaller version of this could be helpful however: putting the Newton Rd/Khyber pass traffic in a direct underpass [one lane each way] and de-tunning Symonds St with LRT and improved pedestrian amenity. Would require a reduction in turning options thereby simplifying all traffic movements. The scheme in the post above would have a horrendous underground intersection which I can’t see ever working, but this smaller scheme removes the east/west through traffic completely and works with the topography at least on the Newton Rd side… it is a double down on traffic sewer however. +1: “Perhaps, just perhaps, a much smaller version of this could be helpful however: putting the Newton Rd/Khyber pass traffic in a direct underpass [one lane each way] and de-tunning Symonds St with LRT and improved pedestrian amenity.”, was thinking the same thing re the other direction. Nah, that’s the direction that the LRT will run and is longer and therefore much much more expensive. Also that isn’t the ‘ratrun’ direction anyway. AT doesn’t do temporary. Somehow temporary trial proposals go into AT and come out expensive, overblown, over-engineered permanent installations that satisfy no-one. They’d probably get a reasonable share of this proposal’s benefits – for a tiny, tiny fraction of its cost – if they (gasp) removed some on-street parking and built the kerbs out for traffic calming and seating/planting. Agreed, Symonds Street between Khyber Pass and Benedict Street is an absolute two-way dragstrip right now. Slowing cars down and bringing this section slightly closer to human scale would probably make a big difference. Seems like overkill. Cost must be pushing $50 million surely? And the disruption during construction would be enormous – you’d probably have to keep cars out altogether for up to a year. The impacts on bus users might also be significant: We’re talking about Mt Eden, Dom Rd, New North Road, and Airbus. Does it not seem easier and more effective to simply put the street on a targeted road diet? Roll back some of the more egregious traffic engineering masterpieces and gradually improve the public realm. Then put in better PT and walking,cycling facilities. Then see what happens? Having looked at similar trench/underground projects lately I would say its a $300-$400 million job. Service relocation are a huge cost (note the main CBD water store next to this! ), as are traffic and construction management. You’d also have to underpin or otherwise stabilise all those historic buildings along both sides, to stop them collapsing when you start to dig. Massive impacts while you are building it, shut down major traffic and bus routes for a very long time. Agreed, much easier and better ways to fix this area. These guys are still somewhere between the “do the wrong thing, but better” stage and the “have your cake and eat it too” stage. Still trying to do everything for everyone and not achieving anything well. Nice idea but it would further clog up Khyber Pass.